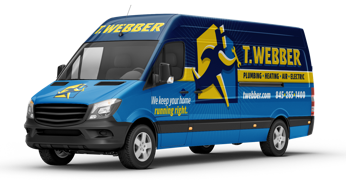 Electrical Troubleshooting & Repair - T.Webber Plumbing, Heating, Air & Electric. Flickering lights? Dead outlets? Tripping breakers? Sparking outlets? We’ve got you covered. When you find yourself thinking, “Where can I find a good electrician near me…”, look no further. T.Webber provides comprehensive electrical troubleshooting and electrical repair throughout the Hudson Valley, including Dutchess, Putnam, Westchester, Orange & Ulster County. Our licensed electricians are trained to troubleshoot your electrical problem efficiently and have the experience and know-how to get it working again. What may seem like a big problem to a homeowner, can be an easy solution for our expert electrical technicians. These warning signs may indicate electrical issues ranging from simple and easy to troubleshoot to dangerous fire and safety hazards. Dealing with electrical problems as they arise will help protect the safety of your home, family or business. If you experience an electrical problem, call T.Webber Services to schedule same-day electrical repair service. Our licensed Electricians are the friendliest, most experienced tradesmen in the area who are trained in the latest technologies. They’re proud perfectionists who listen to your needs and do a thorough job.